New Alive Bots for Clubs! Are you one of the many club owners that use SmartBots and whose visitors love to see a club full of people and looking “alive”? Then these new club themed bot modules are for you! Introducing the set of themed alive bots for clubs to entertain visitors as well as bring additional income to the club. 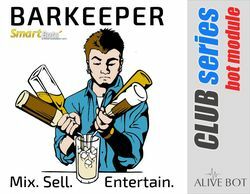 The Alive Barkeeper bot will liven up your club by serving a wide variety of drinks to customers! You can read more about the Alive Barkeeper here. Entertain your guests by having strip dancers put on a visual performance! You can read more about Alive Strip Dancer here. You can view a demo of both bots at our in-world office. To purchase the modules please visit our bot store.